La Belle Assemblée, April 1808. It is great to see these two dresses side-by-side, as they show two very different, but typical, styles of neckline for evening wear. Both are revealing, but the one on the right much more so. It almost looks like a costume malfunction about to happen! “No. 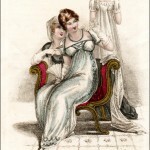 3.–AN EVENING DRESS. 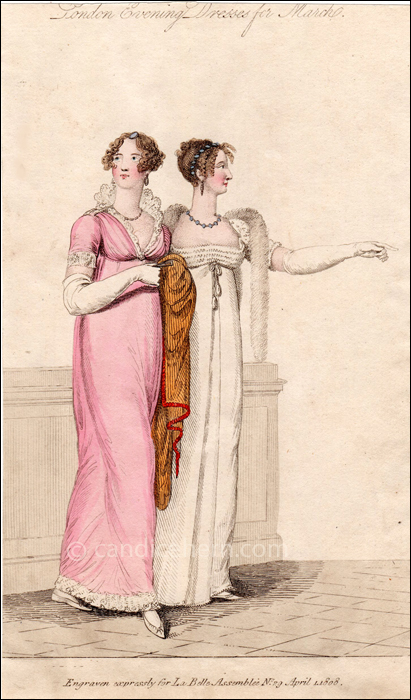 A round dress of satin, an apricot blossom or spring green; made a walking length, and trimmed at the feet with a deep thread lace(placed an easy fullness), or a scolloped fringe. The dress constructed high in the back, with full robin front, and plain frock sleeve. The new fan, or Queen’s ruff, of rich pointed lace, with shell scolloped edge, sloped to a point in front of the bosom, and finished with an onyx brooch; the bottom of the sleeve to correspond with the dress. Hair cropt behind, and formed à-la-rustique in front, divided in the center of the forehead, with a large onyx set in deep gold. A twisted necklace of the milk-white Bohemian pearl, linked with gold beads; bracelets and earrings of the same. Slippers of white satin or kid. trimmed with silver. Gloves of French kid, above the elbow. Opera fan of carved ivory. Angola shawl of deep amber, thrown negligently over the arm as an occasional wrap.